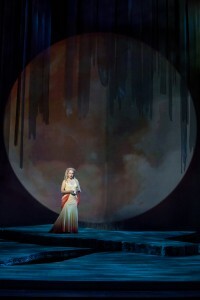 Minnesota Opera’s production of Antonín Dvořák’s Rusalka, with soprano Kelly Kaduce in the title role, has returned to the Ordway after its premiere in 2008. 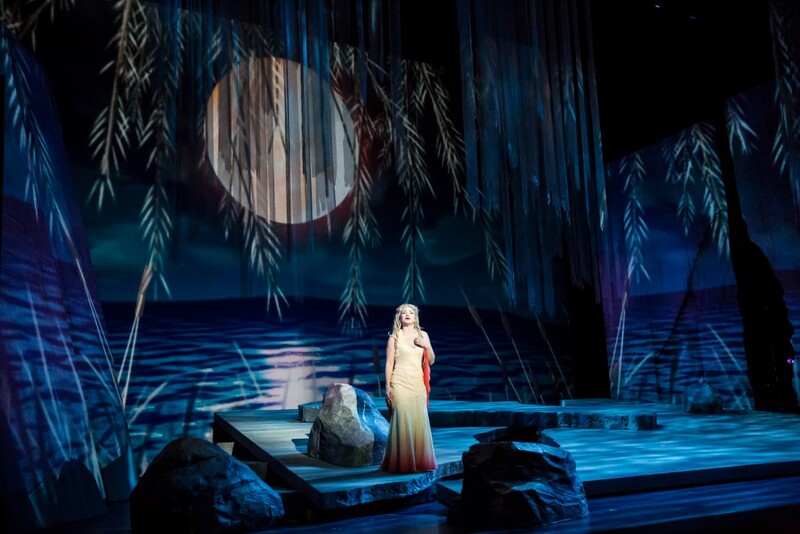 This fairy tale opera had not appeared in United States until the mid-1970s, but this richly textured staging and Dvořák’s full-bodied score should be an immediate favorite for Minnesota opera fans. Kelly Kaduce sings the famous “Song to the Moon” to a Supermoon backdrop. Photo by Dan Norman. Another highlight of the night is bass Ben Wager in the role of Vodník, the water gnome, who transitions credibly from lusty nature spirit to heartbroken father; his voice brings out both the depth and tenderness of Dvořzák’s music. As the witch Ježibaba, Marianne Cornetti vacillates between charmingly batty and actually terrifying to great effect, with a commanding mezzo-soprano. Standing in for Khachatur Badalyan in the role of the Prince on opening night was A.J. Glueckert; Glueckert is more thoughtful than dashing as the romantic lead, believably ambivalent about his beloved Rusalka in Act II and enticed by the haughty and conniving Foreign Princess (sung beautifully by an icy Shannon Prickett). Siena Forest, Bergen Baker, and Jennifer Panara give voice to the dryads of the forest surrounding Rusalka’s river, with David Walton appearing as the Hunter. The real strengths of the production are the stunning visuals on display, which only serve to enhance and elaborate on the action and the music. The production is a study in contrasts: Erhard Rom’s sparse and elegant set design provides the perfect template for Wendall K. Harrington’s dreamy projections and Robert Wierzel and Paul Hackenmueller’s vivid lighting, which all work together to transport the audience from the lushness and vibrancy of the natural world to the stark and stony mortal realm. A trio of dryads dance. Photo by Dan Norman. 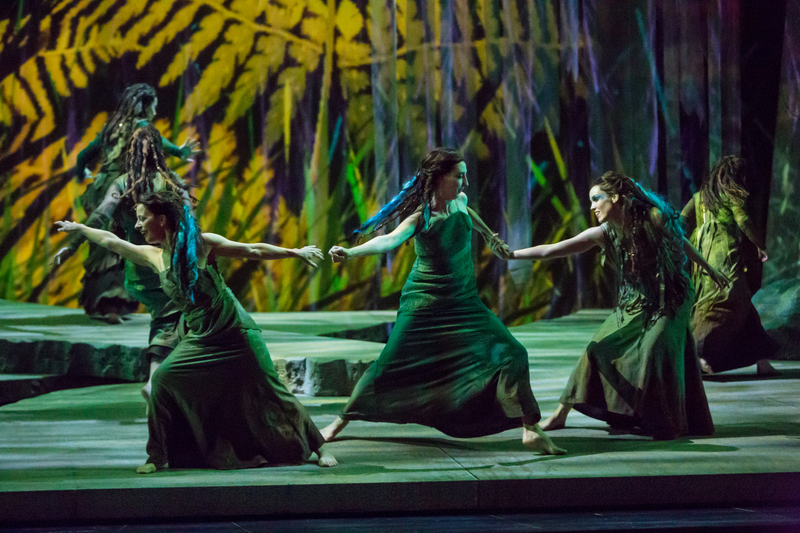 Kärin Kopischke’s costumes and David Zimmerman’s hair and makeup design highlight the austere formality of Prince and Princess in opposition to the earthy comfort and flowing ease of the forest and river folk. 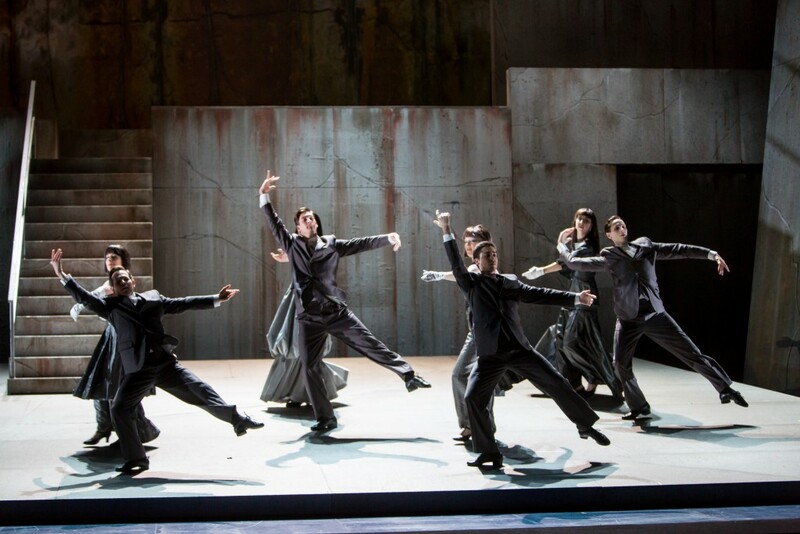 Though there was an occasional moment in the second act when the activity surrounding the main characters pulled focus away from where it should have been, overall Heidi Spesard-Noble’s choreography blended dancers and singers seamlessly together. Eric Simonson’s stage direction and Michael Christie’s conducting steered Saturday evening to success. 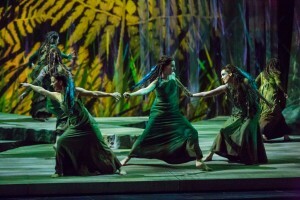 One of the distinctive sets designed by Erhard Rom (Kelly Kaduce, center, as Rusalka). Dancing at the Prince’s castle. Photo by Dan Norman. 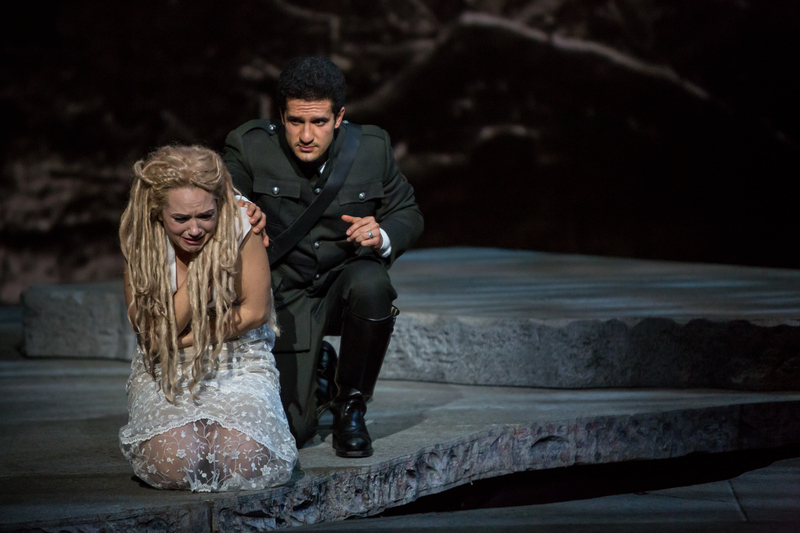 The path of love is rarely smooth with Rusalka (Kelly Kaduce) and the Prince (Khachatur Badalyan). Photo by Dan Norman.